Cassie, aged 16, has not had an easy time since her father died. She’s almost inexplicably drawn to darkness and the macabre. And what began as gentle curiosity has evolved into something much, much sinister. He also knew the rites – the dark ones they practiced on those moonless nights amongst the graves. She met new friends – Seth, Silvia and Trish – fellow goths who have a taste for darkness. They convince her to join them for a Black Mass – a ceremony worshiping Satan – and while Cassie was dubious, she didn’t take much convincing. She was intrigued and excited by this forbidden knowledge. The alter was about three feet tall, and draped in a burgundy-colored cloth with an inverted cross embroidered into it. And, shortly after the mass, Cassie’s life is completely upended. They were always watching, she realized – every thought and deed…Always there. Always watching. And always waiting. Returning from the Black Mass, Cassie has little control – she watches as her life spirals into drugs, alcohol and vengeful thoughts. Demonic possession. And then she dies – well kind of. She is involved in a car accident is is pronounced dead but was later revived. And, like a miracle, everything that was pushing her over the edge is gone. She’s able to settle back down…but little does she know, evil doesn’t just go away. …a deep crushing fear gripped her as she continued to stare at the empty window. 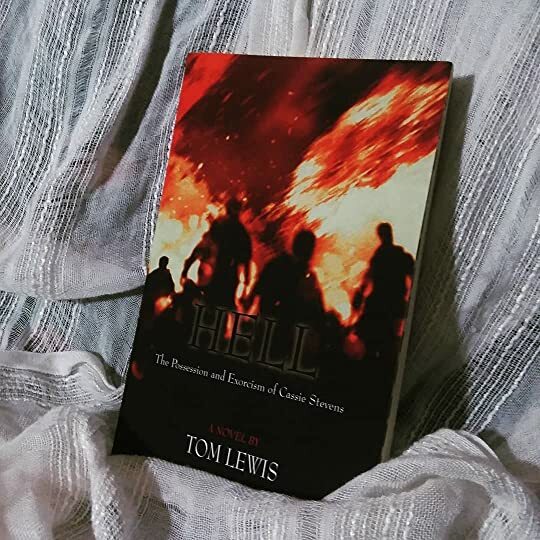 Tom Lewis’s Hell was terrifyingly awesome. Lewis perfectly captured the inner monologue of Cassie and I wasgenuinely creeped out by his novel (I couldn’t read the Black Mass!). But it wasn’t all gore and horror – I loved subtle elements of humor that lightened this considerable novel. The side plot involving Sean, a young Father, was intriguing. Watching his inner struggle of faith while projecting an outward impression for his parishioners really spoke to me. I do wish the transition between the possession and the ending was a bit longer. The book did feel like it was wrapped up rather quickly, but honestly it was so riveting that I hardly noticed. This was such a gripping page-turner, I loved every chapter! Definitely my favorite Tom Lewis novel. All sheep, that voice whispered again.